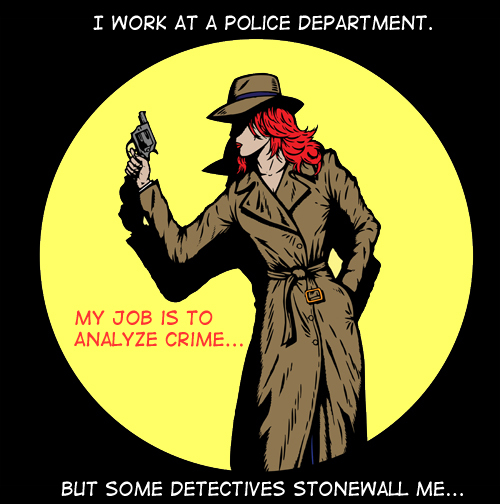 Office-Politics » How can I analyze crime if I’m stonewalled? I work at a police department. I am in a “non-sworn” position. My job is to analyze crime – identify crime series/trends/patterns, do tactical and strategic analysis, etc. I am a department of one which makes things difficult as I don’t automatically have anyone who “Has my back”. And I’m dealing with different “Teams” of people – like patrol, detectives, problem oriented team -etc. I identified a burglary series. I did a lot of work mapping out the burglaries, making a speadsheet, creating a bulletin with all of the pertinent information, and I also took the extra step of typing out all of the stolen property by case number so that if the detectives find out where the property is they can easily identify the property since our Records department was behind in data entry. What I did was very time-consuming. After I was done I told the property detective that we had a series going on to give him a heads up, and I told him that I was working on a property sheet, etc. He doesn’t want to hear about it because he has yet to get the case assigned to him. After he gets the case assigned (the next day) he starts being cold to me. If I walked in the room he’d turn his back to me, he stopped acknowledging me when he walked by my office, etc. When the Sgt (his boss) is back at work a week or so later, I also let him know that I have the property sheet available (because I didn’t want to do anything to sabotage the case). Well, a few nights ago, patrol located the suspect and a house containing a lot of stolen property and the detectives get called out to the scene. Neither the detective nor the Sgt calls me to obtain the property sheet. They were able to identify a lot of the property but it would have been much easier if they had this sheet. Again, it is not my responsibility to put together this information, I just did it to be nice and helpful. When I got to work I found out they were searching a house so I asked another detective if they had this property sheet. He said, “No” but that they had been “Looking all over for it”… Again, they could have easily called me but chose not to. I called the Sgt and he told me the detective DID have the property sheet – but he really just had a couple of recent bulletins I had distributed with the most recent items stolen. The next day I have a meeting with the detective LT and the Sgt. Neither one is my boss. The LT basically tells me that the detectives are frustrated with me because they think I can be “Pushy” and I need to understand that the detectives have A LOT of cases and they might not get to the series right away. Apparently this detective felt like by me giving him this heads up, I was trying to get him to immediately work this case. When my intention was to let him know it looks to be part of a series and let him know what I’ve done to assist (trying to be helpful). They basically want me to have empathy for THEIR work, yet nobody has any empathy or consideration for my time/work, etc. To make matters worse, the detectives are OFTEN goofing off – they play catch daily – even went outside one day and threw a football around (and no it was not their lunch). They are always sitting around chatting, while EVEN homicides will go unsolved (CSI employees are also often frustrated). So I have a difficult time having empathy for their caseloads when they have so much time to play. (But no, I never brought this part up – I didn’t think it would go over well.) When I asked the LT and Sgt what they wanted me to do differently, they had NO ANSWER. They were stumped! The Sgt seemed to “Get It” and realized he needs to educate the detectives on my role in the department – but I doubt he actually will because the culture is such that the sworn personnel rarely hold each other accountable – I often see the non-sworn become the scapegoats. I have a difficult time doing my job – sharing information with patrol, etc – when the detectives withhold information from me. And it bothers me that they seem to try to dampen my enthusiasm. I asked them if they would prefer me to just provide this type of info to LT/Sgt and they can pass it on to detectives but they want me to go directly to the detectives – yet when I do, I get this nasty reaction. So I feel like I’m in a no-win situation. When I first started consulting work, a wise mentor pulled me aside and reminded me that a consultant can never care more than the client. I found the advice odd, but I quickly learned how accurate it is. As the “outsider” we consultants become aware of things that our cubicle dwelling cousins don’t see because their blinders are on. Some of the issues we uncover are sacred cows, those “hands off” issues which are more sensitive. It sounds like your relationship with the detectives is similar to my relationship with some of my past clients. Because I volunteer with law enforcement, I was able to go right to the source for some insight on your letter. One of my good friends is a Lieutenant who oversees a role similar to yours. You mentioned your work with the Sergeant and the Lieutenant who oversee the detectives, but you never mentioned who your commanding officer is, so I’m assuming you answer up through some chain of command within the department, so let’s start there. Have you talked with your boss about “watching your back” and explained to him or her some of the challenges and frustrations you are facing? First and foremost, you need an ally within the department, and there should be nobody more qualified that the person who authorizes your existence. The second issue I saw in your letter had more to do with marketing and demand than it did with office politics. You need to demonstrate your value visibly to the detectives. Yes, it’s one thing to “be nice” and do analysis that’s not part of your job, but this gesture was not well received. I’m curious, where are you physically located within the department? Do you sit among the detectives so you can interact with them on a regular basis? Do you attend their meetings? One of the traits of an excellent detective is observation. Are you watching the detectives? Are you able to observe their hot buttons? If you are around them regularly, you can hear comments like, “I sure wish we had this information…” or “Why can’t we ever get X data when we need it?” Then you can respond to the things your client cares about, rather than making assumptions about the crimes you think they should care about. If you are physically around the detectives more, and if you listen to their needs, that should provide you with clues on how to proceed with your work priorities. If you are not physically co-located with the detectives or are not attending their meetings, talk with your boss to make these happen. And once you’ve had the opportunity to provide visible value which is appreciated by the detectives, then you can move on to being more proactive. You need to sell your skills to your customer… only then will they “buy in” to the services you provide. Besides your own boss, you might consider doing some alliance building. As I mentioned, I’ve been around police enough over the past two years to recognize that, for lack of better phrasing, “boys will be boys.” (Yes, there are plenty of women officers, too, but it sounds like you might be dealing with a male-dominated network.) Instead of criticizing them for playing catch during the day, join them. Often times, they may be verbally processing cases while they are out playing, and you could be missing out on that information because you are sitting inside stewing that they’re outside playing catch. There are considerable stressors for any job, but few rival what patrol and detectives encounter on a daily basis, so these outlets during the day are healthy ways for them to do their jobs. As one who supports them, you need to be fostering a spirit of partnership and camaraderie rather than antagonism. Find a detective or two with whom you already connect on some level and take them out to lunch. Let them become your cheerleaders with the one who appears not to like you. Finally, documentation would be a good thing to have in your back pocket. If you share some analysis with a detective via email, save that as “evidence” you’ve shared it so they can’t come back and claim you were withholding information from them. If you share something in person with a detective, send them an email later: “Hey Detective Tom, glad we had a chance to talk about the evidence. I hope the burglary analysis spreadsheet I gave you is helpful. If you need any further assistance or more information, please don’t hesitate to contact me.” This provides you with proof that you did give physically give them the information, and it puts the ball in their court to contact you if they want more. The next time the sergeant or lieutenant call you into their offices to accuse you of not sharing information with the detectives, you will then have an email in your SENT folder to show otherwise.